Caroline Wozniacki asks Rory McIlroy a question in Dubai on Thursday. 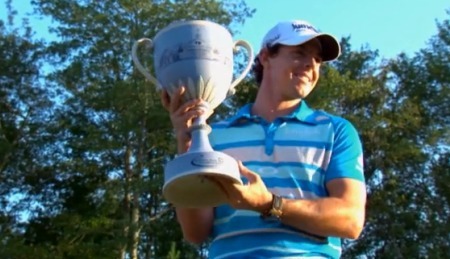 Picture Eoin Clarke/www.golffile.ieWhen Graeme McDowell won the US Open in 2010, Rory McIlroy was inspired to go out and win it the following year. But could the world No 1 be about to follow in McDowell’s footsteps and propose to girlfriend Caroline Wozniacki? It’s a longshot, at best, but 23-year old McIlroy is not one for doing things by the book. 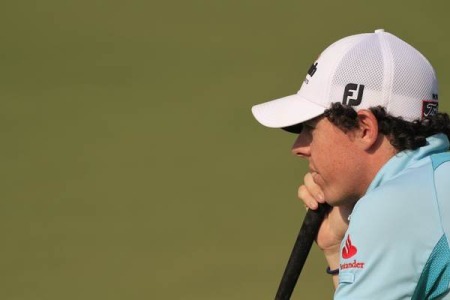 McDowell popped the question to Kristin Stape on the helipad at the Burj al Arab earlier this month and after a cheeky exchange of questions between McIlroy and Wozniacki at the DP World Tour Championship in Dubai today, you have to wonder. After watching McIlroy shoot a 66 to lie a shot off the lead, Wozniacki gatecrashed his post-round press conference. 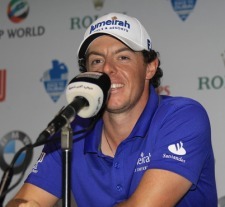 Rory McIlroy answers questions from girlfriend Caroline Wozniacki in Dubai. Picture Eoin Clarke/www.golffile.ieAccording to agency reports and Gulfnews.com, she ignored McIlroy’s “don’t even think about it” warning as he walked into the room and saw her among the press-pack. …the winner of 20 WTA career titles stood up toward the end of the conference, much to her boyfriend’s embarrassment, and said: “You obviously have unbelievable support this week. “You’re a better tennis player,” said McIlroy, to raucous laughter from reporters. “That’s not nice,” Wozniacki retorted. “That’s it for today,” replied the Dane. With the pact made public, Rory, who’s earned $12.7 million from winning the money-lists on both sides of the Atlantic this season, now has no excuse not to put something half decent under the Christmas tree. And with the pair having officially dated since August 2011, it won’t take a tabloid reporter with an ounce of imagination to start wildly speculating about what the gift might be. Caroline Wozniacki has been a good influence on Rory McIlroy according to Graeme McDowell.Rory McIlroy’s love match with Caroline Wozniacki has made him even more determined to topple Luke Donald and become world No 1. That’s the view of pal Graeme McDowell who hopes to have his say as he joins his stablemate and Open champion Darren Clarke in this week’s WGC-Accenture Match Play in Arizona. An updated version of the Daily Mail story featuring a reference to the fact that “This is not true”When Caroline Wozniacki quizzed Rory McIlroy during a press conference at the DP World Tour Championship about what she was getting for Christmas, there were jokes in the media that it wouldn’t be long before the engagement rumours started flying.